Major aircraft manufacturers around the world have long relied on sheet-hydroforming presses—fluid-cell and rubber-pad styles—for economic production of low-volume parts. Rubber-pad forming in a hydraulic press took flight (so to speak) in the 1930s and ’40s. In the 1950s and ’60s came fluid-cell technology, which replaced the rubber-pad upper forming tool with a thin and flexible rubber fluid-filled diaphragm. Fluid-cell capabilities surpassed those of traditional rubber-pad forming, providing more consistent results with evenly applied pressure over every square inch of the part. 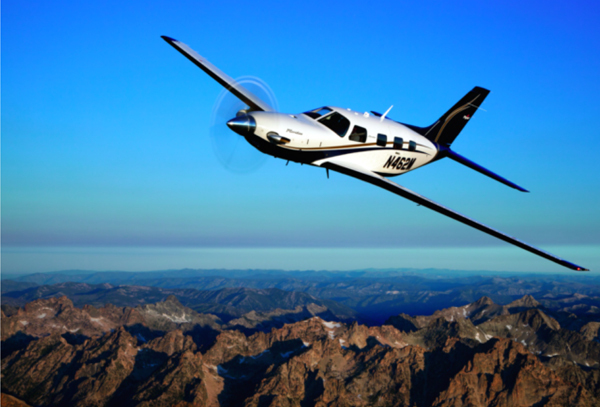 To learn how the fluid-cell hydroforming process has evolved since those early days, we spoke with Piper Aircraft, Inc., which operates a 754,000-sq.-ft. manufacturing plant in Vero Beach, FL. The plant—of which 280,000 sq. ft. is dedicated to fabrication and forming operations—has long operated a pair of huge and aging fluid-cell presses, an 800-ton Verson Wheelon and an Asea (now Avure) 1000-ton press. These presses have proved very versatile for fabricating a variety of airframe parts and skins of all shapes and sizes, primarily of Type 2024 aluminum sheet 0.020 to 0.125 in. thick. Aluminum alloy 2024 is an age-hardening alloy that contains 3.8-4.9 Cu, 1.21.8 Mg, 0.5 Si and 0.3-0.9 Mn, and boasts a tensile strength of 68,000 PSI, yield strength of 47,000 PSI and an elongation of 20 percent in 2 in. As Piper’s Asea press began to show its age, beginning around 2008, maintenance technicians were required to replace the bladder every 12 to 18 months—an expense engineers quickly found annoying and disruptive. A Piper Aircraft technician fixtures a small, custom aluminum-alloy blank to be formed in the firm’s new 500-ton small-footprint Triform sheet-hydroforming press. Fluid-cell forming proves particularly useful in forming parts with shallow flanges, illustrated here. See’s desire to reduce the workload of the company’s larger bladder presses has been a familiar tune in the aerospace-fabrication world, says Cecil Sterne, vice president of sales for Pryer Technology Group. Pryer manufacturers exactly the type of presses See and his coworkers at Piper envisioned. Certain models from its line of 5000- and 10,000-psi Triform presses cycle in as little as 15 sec., as is the case with Piper’s new Triform Model 16-5BD. Piper installed its Triform press in November 2011. Since then, it has moved over some 500 part numbers to the press, about 20 percent of the total part numbers the company forms in its sheet-hydroforming area. “We’re running whatever we can fit inside that press,” shares James Priest, lead press operator. The press boasts a maximum chamber pressure of 5000 psi, forming area of 16-in. dia., and 5.5 in. of daylight with 4.75 in. of form-tool clearance. Flexible die forming—characterized by the fluid-cell processes used at Piper and also by the rubber-pad process—proves particularly useful in forming parts with shallow flanges, as shown in the accompanying photos. Pre-cut blanks are positioned onto a die block that gets placed within the forming area directly, or via a loading tray which is then shuttled into the press. The fluid cell is inflated with high-pressure hydraulic fluid, expanding to force the blank around the die block and following its contour. 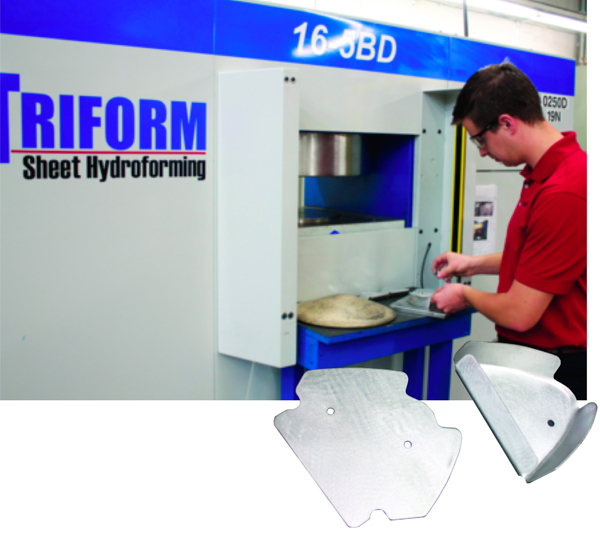 Triform sheet-hydroforming presses are offered in two configurations. Triform Fluid Cell presses, such as the 16-5BD at Piper, use the downward action of the bladder to form sheetmetal around an unsecured form block. For applications that require controlled material flow, such as deep-drawn parts or those with certain curved geometries that might wrinkle during forming, deep-draw sheet-hydroforming presses provide superior results. Triform Deep Draw presses use the same principle as fluid-cell models, but with the added capability of an upward-acting punch cylinder to which the tooling is attached. The combination of the downward-acting bladder with the upward-acting punch tool allows for the successful deep drawing of parts otherwise unobtainable from a single machine cycle. A programmable motion controller is at the heart of both Triform models. For a closer look at the press’s design and functionality, we received the following input from Richard Meyerhoefer, regional applications specialist at Delta Computer Systems, Battle Ground, WA. Triform Deep Draw presses precisely control the punch position and bladder-fluid pressure. As fluid pressure in the bladder increases, the press clamps the material and begins to force it down around the form tool. Simultaneously, a hydraulic cylinder presses the punch into the bladder, wrapping the sheetmetal workpiece to conform to the punch. For his Triform presses, Pryer opted for an RMC multiaxis programmable electro-hydraulic motion controller from Delta Computer Systems. The result is precise position control to ±0.002 in., and pressure control to one percent of full scale. On fluid-cell presses such as that used at Piper, the Delta RMC controls the cylinder that varies the bladder pressure. On deep-draw machines featuring hydraulic punch cylinders, the RMC controls two motion axes: the punch cylinder that pushes the tooling into the bladder (see figure), and the cylinder that varies the bladder pressure. On larger Triform models, the RMC pulls triple duty by also controlling movement of the containment clamps and the upper chamber that closes around the bladder and workpiece. Programs developed for the motion controller allow operators to select production recipes that contain as many as 30 different steps in a press cycle, each step corresponding to a target bladder pressure and punch position (on deep-draw presses). Besides the target values, motion instructions specify how the machine is to get to the next target. 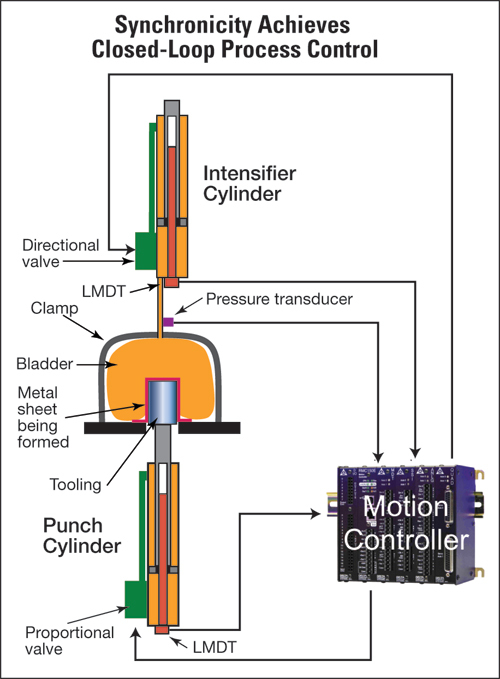 At the beginning of a machine cycle, a quick-move instruction sends the punch cylinder axis to its initial position, while the bladder is precharged to a particular pressure. Then, during forming, the punch axis is given a position command with an acceleration and deceleration parameter for each process step. Meanwhile, the RMC sets bladder pressure and coordinates it with punch-axis movement. Bladder pressure is monitored and fed back to the motion controller by a pressure transducer typically capable of reading between 1 and 10,000 psi. To ensure precise punch operation, control outputs from the motion controller to the punch hydraulics connect to a servo-quality proportional valve.